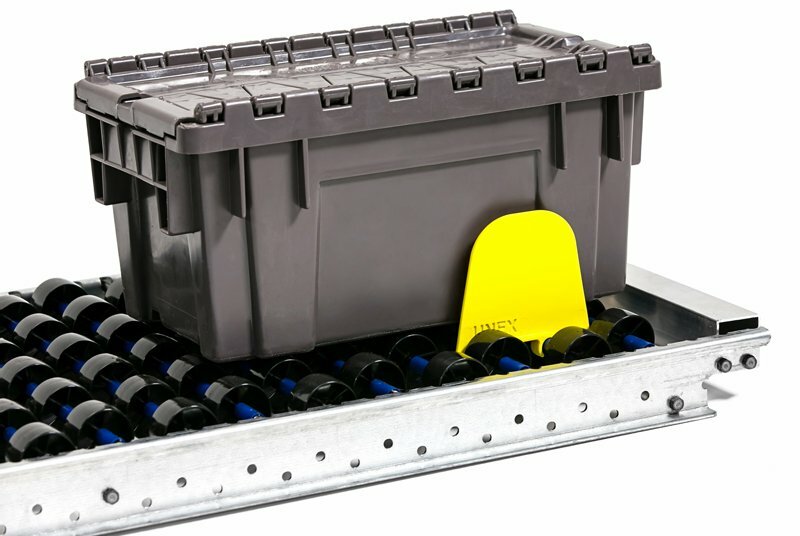 UNEX Manufacturing, Inc., the trusted industry leader in providing innovative order picking solutions, announces a promotion for the UNEX Shelf Track solution, a durable carton flow system that drops easily into existing racks and shelves within warehouses, manufacturing plants and distribution centers. Five free infeed “shark fin” guides are included free for each level of Shelf Track wheel bed purchased. UNEX’s Shelf Track is guaranteed to decrease pick times and increase your operation’s efficiency when compared to unreliable plastic wheel rails. Now through September 30, 2017, the UNEX Shelf Track promotion will include five infeed guide accessories added for no cost for each level of wheel bed purchased. UNEX Shelf Track offers wheel beds with its patented Hex Hub wheel design to increase flexibility for slotting, providing 90% left to right bay usage. The wheel beds allow cartons to flow forward when the carton in front is removed, preventing the worker from having to reach into the rack to pull it forward, which can cause stress on the worker’s back. UNEX Shelf Track works well with seasonal merchandise when you get odd-sized boxes that you typically don’t store. UNEX Shelf Track’s sturdy track is more durable for order picking operations than plastic wheel rails used by competitors. Often, the weight of cartons imprint onto cartons making dimples so that the product can’t flow forward. As carton flow systems are used in many order picking processes, workers expect the pick face to always have product there. Plus, when working with products that have expiration dates, Shelf Track for carton flow facilitates first in/first out (FIFO) movements so that products are stored and picked in the right sequence. To get more details or request a quote, click the button below!